Winter is coming to Japan. Soon the daytime temperature in Tokyo will be hitting low single digits and already snow has fallen in the capital; though admittedly that was the earliest winter wonderland has arrived in nearly sixty years. 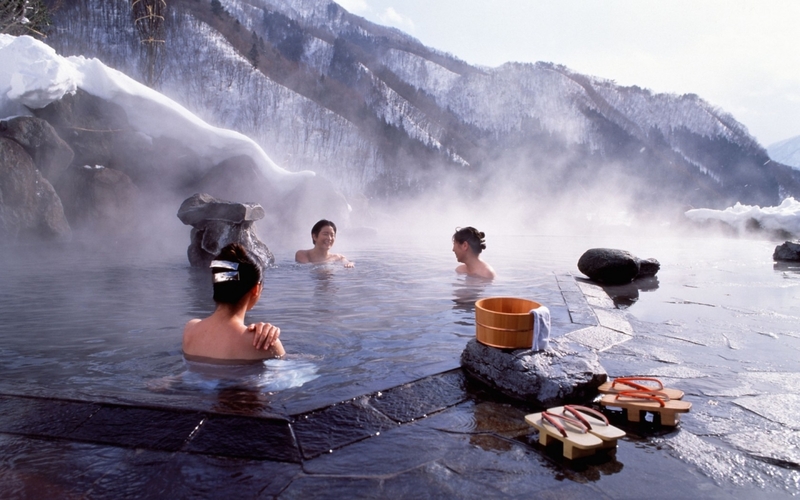 And this means it's onsen season. Yey! It may sound a little strange to the uninitiated but one of the greatest pleasures in life is to laze in a tub of hot water with friends as the snowflakes falls around you. And Japan is very good at this. These days there are four essential styles of onsen (hot spring) that are popular with the populace. The international tourist focussed ones tend to require swimsuits but the traditional pools are almost universally au natural as it were though modesty maintained with a handy modesty towel. The classical onsen are segregated allowing your time or relaxation, neck deep in piping hot water, with the guys or girls. Though it has to be said the chatter from the ladie's side tends to be a little (lot) louder than the men's. Konyoku, mixed bathing, is actually the traditional variety (it's not inappropriate to bathe, however it is inappropriate to look) but these largely disappeared following western influences over the last century though if you really search around they can still be found, hidden away. And the final version is known as kazokuburo, or family bath. Usually unfrequented by teenagers but younger families or the slightly older will enjoy time together chatting the night away. Japan is more relaxed about spending family time together, a little freaky for a westerner, but just wait for the snowflakes to fall. Winter is coming.